Welcome to Adelaide Jewish Museum, a virtual museum for Jewish Adelaide. There is a proliferation of Holocaust and Jewish museums in cities around the world. In Australia, there is a Jewish museum in Melbourne and Sydney, and a Jewish Centre in Perth. Adelaide has also identified a need for a Jewish museum. all the activities associated with running a museum. While acquisitions of Judaica are occasionally made, and donations of objects are always welcome, this is not actively encouraged. Australia, where freedom of religious expression is guaranteed, represents a refuge for Jews escaping religious persecution or political upheaval. There are a great many stories of Jewish life that should be recorded, from the extraordinary to the ordinary, and many people have already made public their remarkable life stories in the collection of narratives in the Book of Life section of the website. While the Museum focuses on contemporary life, it has also started the process of documenting the history of Jewish Adelaide, beginning with the establishment of the Jewish community in the 1840s. Through the State Premiership of Mr Vaiben Solomon in the late 1890s and the period of Jewish Lord Mayoralty in the 20th century, ours is a significant contribution to South Australia’s history. With the creation of the virtual museum we hope to enhance the knowledge base, and engender appreciation and understanding of Jewish life and culture in a wider audience. Today, the Adelaide Jewish Museum can be referred to as a virtual museum. Building up a collection of objects is a slow process. We intend to use the website as a forum for documenting interesting objects of Judaica within the community, as well as documents and general objects relating to the lives of the Adelaide Jewish community. However our major focus is the collection of human stories of the community, both of the gnereration of holocaust survivors and theoir children. In effect, community collecting is a solution to the problem of museum collecting: the museum collection exists externally, with community responsibility for looking after and insuring their own objects. The community is invited to submit images of items, photographs and documents in their personal collection together with captions for inclusion on the site. “Behold, a good doctrine has been given you, My Torah, do not forsake it. It is a tree of life to those who hold it fast, and all who cling to it find happiness. Its ways are ways of pleasantness, and all its paths are peace”. 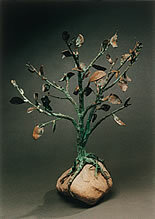 In 1999 the Jewish Community of South Australia curated an exhibition entitled the Tree of Life, for display at the Migration Museum (June to August 1999). We have recreated most of this exhibition on the Adelaide Jewish Museum website as it is an opportunity to add instant historical depth to the site. The exhibition panels were scanned for the website in July 2002 by Terri Matthews from Fuji Xerox Adelaide. The original exhibition was sponsored by Adelaide City Council; Adelaide Hebrew Congregation; Beit Shalom Synagogue; Council of Christians and Jews, SA; Nyra and Albert Bensimon; Carol and Norman Schueler. I Aarons; S Almond; K Bailey; J Billingsley; G Bloustien; P Goodman; A Lipschitz; D Lipschitz; T Sharp; J Soininen; SA Union of Jewish Students. M Ades; N Bensimon; K Benveniste; T Blumenthal; C Finnimore; K Goode; R Hoenig; M Luno; A Matison; L Ninio; G Rich; H Tversky-Steiner; B Yallen. “For it is a tree of life for those who grasp it, and for them that uphold it, everyone is rendered happy. Its ways are ways of pleasantness and all its paths are peace. Long life is at its right side, riches and honour at its left”. The above quotation from the Torah, the guidebook to Jewish life, refers to the study of this vital text. Through the approach suggested in the Torah, we celebrate Jewish existence. The quotation was the inspiration for a fundraising project that includes a major artwork installation called the Tree of Life. Celebrating over 150 years of South Australia’s Jewish community, the Tree of Life provides sponsors with the opportunity to own part of the Tree by contributing funds to the Adelaide Hebrew Congregation. With the kind permission from the AHC and the artist Simon Kessel, the Adelaide Jewish Museum has used the image of the Tree of Life sculpture for its identity and logo. The tree casts a shadow in the form of a menorah, the archetypal symbol of Judaism. This aspect of the design was the inspiration of graphic designers Hollinshead Zikas. More about the Tree of Life Artwork, and the Artist, Simon Kessel. This is an opportunity for South Australia’s Jewish community to share stories about their lives and to document their family history. Families that have relocated elsewhere subsequent to living in South Australia are also encouraged to submit their stories. Email your story to Jewish Museum if you wish to publish it on the Adelaide Jewish Museum website. Photographs and documents can be scanned in to add value to the written word. The Adelaide Jewish Museum publishes stories from the community on the Museum website. The records are freely and publicly available. However, copyright remains with the author. Anyone wanting to edit, reproduce, publish, broadcast, perform or adapt the records must get written permission from the author first. This is an example of blog page layout on separate page. Dreams that do come true can be as unsettling as those that don't. Welcome to the Links section of the Adelaide Jewish Museum. Here you can find links related to Jewish life in Adelaide and around Australia. http://www.jcssa.asn.au/ - Jewish Community Services South Australia?